Manatee Springs State Park occupies 2,443 acres along the Levy County side of the Suwannee River east of Chiefland, Florida. 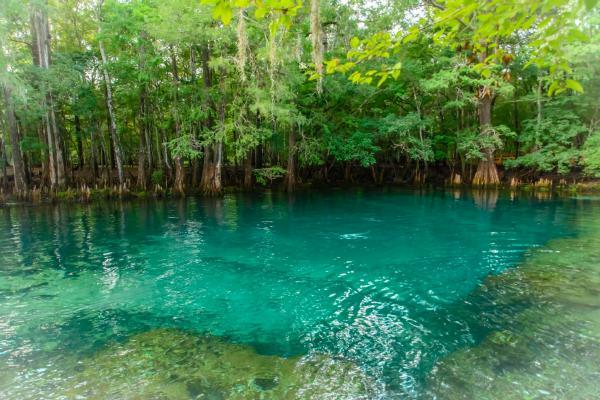 It's primary feature is a 1st order spring that discharges as much as 100 million gallons of water daily that flows about 1/4 of a mile along Manatee Springs Run into the Suwannee River. The park derives its name from the numerous manatees that swim up the Suwannee River during the winter months to warm in the outflow of the spring.. The park is centered around the headwaters to the spring, where swimming and snorkeling is allowed. Kayaks, canoes, snorkeling gear, and pontoon boats may be rented from a concessionaire in the park. There is also a snack bar and carry-out barbecue service for those who are visiting or picnicking. Picnic tables, shelters, an amphitheater, and a kayak launch is available for day use. In addition to the spring and the Suwannee River, there are over eight miles of nature trails in the park that will take you on a tour of the spring run, cypress swamps, sinkhole ponds, and uplands. Trails in the north end of the park are open for off-road bicyclists as well as hikers. Manatee Springs State Park is also close to the paved Nature Coast State Trail that runs 32 miles from Chiefland to Cross City. Scuba diving is allowed in Manatee Springs State Park. And cave diving is permitted at certain places including the main spring, "Catfish Hotel", and Friedman Sink - which all connect to each other through a vast underwater cave system. Due to the high flow of the spring system, the most popular route is to enter at CatFish Hotel and float downstream to emerge at the main spring. All divers must register with park personel, be certified, and have at least one partner. There is a strict limit on the number of divers allowed in the cave system at one time.